The Orthodox Homechurch of the Holy Cross in Halle was consecrated in February 2000, with the blessing of Archbishop Feofan of Berlin, and with a large group of priests and laity in attendance. The orthodox congregation in Halle was founded in June 1999, though Orthodox church services had been held in the Moritzkirche in Halle since September 1998. Rev. A. Tomiouk, dean of the of St. Alexij memorial church in Leipzig, was appointed head of the new parish. The homechurch is situated in House nr. 24 of Franckeschen Stiftungen in Halle. All the painting, decoration and construction work was done according to the design of two Moscow icon painters: Rev. Ioann Zaretskij and W. Scherbinin, who had come to Germany for the purpose. 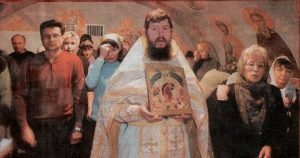 Icon paintings, which cover all the walls of the homechurch, represent the old Russian icon painting tradition. On the walls to the right and left can be seen icons of Christian saints and scenes from the New and Old Testament. Fourteen icons form a small carved oak iconostasis – a wonderful example of the same tradition. There are two gates in the holy Altar behind the iconostasis. The central one is called the Royal Gate and is opened by the clergy at a particular moment during worship. In the bottom row, on the right of the Royal Gate, there is an icon of the Savior. On the left side there is an Icon of the Mother of God. This icon is a copy of the miraculous image, which is called the icon of «Odigitria». In the middle of the second row you can find the icon of the “Last supper”. To the left of it you will see the icon of the Nativity of Christ, and to the right of it the icon of “The exaltation of the Holy Cross”. The whole work took seven months to complete. The homechurch of the Holy Cross now serves as a religious center for the Orthodox population of Halle. Services are conducted in it on the 1st and 2nd Saturday at 9.00am. The Homechurch also holds other services and a Religionsunterricht-Gruppe. 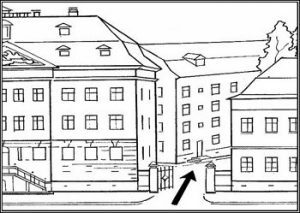 On one occasion, while granting the parish a donation for the construction of the homechurch, the mayor of the city Dr. Rauen cordially welcomed its small congregation and wished them success in their cultural and religious work in the city of Halle.